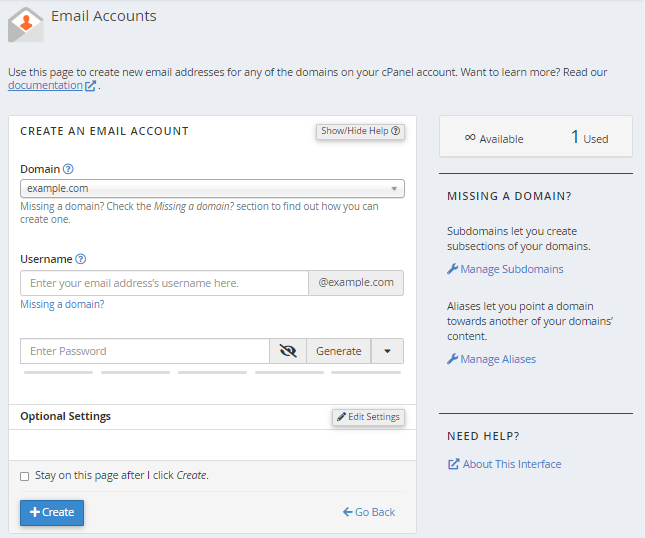 Support Portal Home » Specialized Help » Email » Email Management » How Do I Create Email Accounts in cPanel? In the Email section, click Email Accounts. In the Email field, type the name you want and select the domain name from the drop-down menu below. In the Email section, click Email Forwarders. Under Create an Email Account Forwarders click Add Forwarder. Enter the email name and select the domain for the address. Select Discard and send an error to the sender (at SMTP time). Enter the failure message you would like users to receive.